The Plantronics DA80 is used in customer service centers that use PC-based softphones. The DA series of audio processors offer exceptional quality and control, and they help you meet OSHA and Noise at Work specifications. 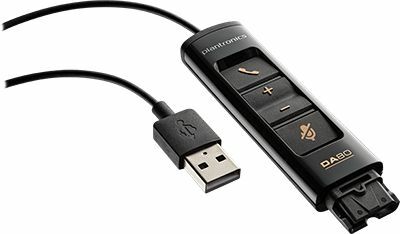 With Plantronics and third-party software applications you will be able to communicate with intelligence and activate new experiences for your team and customers. The DA80 connects your Plantronics Quick-Disconnect analog headsets to PC via USB.